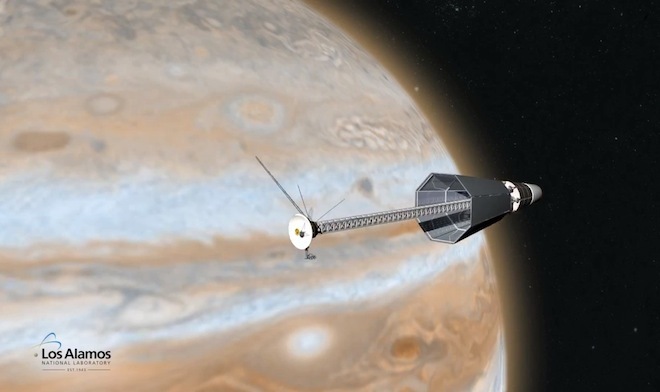 A proposed deep space probe to Jupiter using the new engine (Credits: Los Alamos National Laboratory). 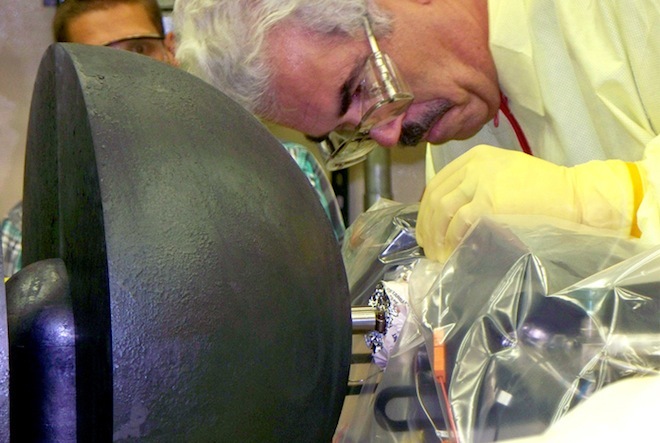 Scientists at NASA and Los Alamos National Laboratory have tested a prototype of a nuclear reactor engine that may be used for future deep space missions. The power generated by solar panels is reduced as a spacecraft travels farther from the Sun; beyond Mars the power generated by panels is not enough to keep a spacecraft on a desired trajectory. Nuclear engines could fill in the gap, playing a significant role in generating non-solar power for deep space mission. The prototype represents the first test of a nuclear engine for spacecraft propulsion in the U.S. since 1965. The engine consists of a small nuclear source and a single Stirling engine, an engine design invented in the 19th century that uses hot pressurized gas to push a piston. The prototype produced about 24 watts of power, which is still very small compared to a deep space mission’s requirement for about 600-700 watts of power; hence some development is necessary before this engine is ready to be used in any spacecraft. Benefits of this engine seem to be promising; such a propulsion system would enable exploration of far planets like Saturn, Neptune, and their moons even when solar energy falls to a trickle.